Enjoy the privacy of a fully self-contained cottage, set on one acre. Surrounded by farmland and the coastal scrub of Port Campbell National Park, the closest neighbours are a kilometre away in the little village of Princetown. Explore the rugged coastline of the Shipwreck Coast and visit beaches off the beaten track. The iconic 12 Apostles are a 2 minute drive from the house. See Gibson Steps and Loch Ard Gorge on your way to the sea side town of Port Campbell, just 10 minutes away. Port Campbell offers a safe swimming beach with lifeguards over the summer period, as well as cafes and a pub. In the other direction, lies the village of Princetown and the mouth of the Gellibrand River where the locals swim. Southern Comfort is exactly that. Comfortable accommodation right near the Southern Ocean. 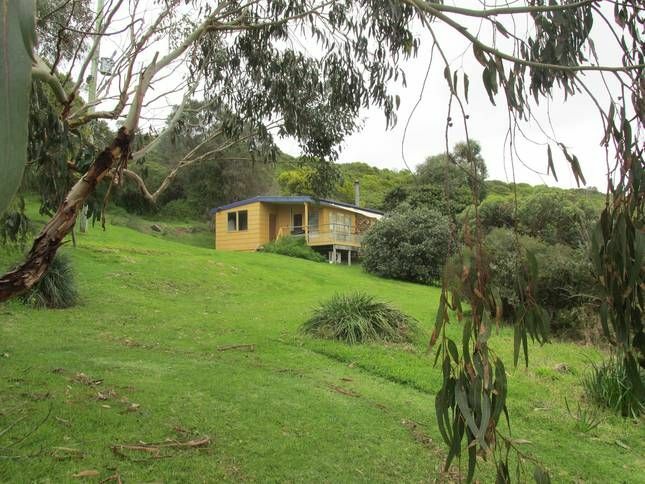 Situated on the famous Great Ocean Road, the cottage sits in an elevated position on the one acre block. The Great Ocean Walk runs along the cliff up behind the property. Parrots, eagles, swamp harriers and willy wagtails are often seen. Kangaroos and wallabies live up along the clifftop. With no neighbours, feel free to be as noisy as you like. There's plenty of grassed area to play footy and cricket. Enjoy stargazing on clear nights. With the closest lights over a kilometre away at Princetown, you'll be amazed at the darkness of the night sky and the clarity of the stars. Furry friends are welcome, however note that the property is not fenced, so it is only suitable for dogs who don't wander. The house offers a fully equipped kitchen, including a microwave and full sized fridge/freezer. An open plan living/dining area features a wood fire with stone surround. (with a fire guard) There is also a split system for heating and air conditioning. The cottage has 2 bedrooms, one with a queen sized bed, the other with a double/single bunk. There is a separate bathroom and toilet. Please note that as we live a long distance from the property, we are sometimes unable to take last minute bookings. We never take overnight bookings. Please note that the house is only suited to a maximum of 5 people. Please also note that we do not have television reception due to the location of the house. Guests must supply their own linen, towels, tea-towels and bath mat. Doonas and pillows provided. (We don't supply linen as we live too far from the property to make it practical). There is no rubbish collection, so guests are asked to please take their rubbish with them. Brand new kitchen, installed October 2018. Due to the distance that we live from the property we don't provide linen, towels, tea-towels or bath mat. Lovely weekend away. The place is just like the photos clean and cozy. We saw kangaroos in the garden. The kids loved the tree house and the fireplace. The house is also close to all the main attractions. We will be back! Very relaxing, Enjoyed by everyone including the dogs. Southern Comfort is an ideal home base to explore all that the Great Ocean Road has to offer. The 12 Apostles are within 5 minutes drive. The home is comfortable and clean with full kitchen, wood fire and peaceful rural outlook. We thoroughly enjoyed our stay and highly recommend this property. Fantastic stay at Southern Comfort. We were working nearby and it was a great base. Very comfortable it had everything we needed. Great hosts. Thank you! This home was exactly as described and we're VERY thankful to the Owners for taking extra care for us in providing linens as we were traveling from overseas and really couldn't bring our own. Wonderful views from an Awesome location. We enjoyed the local birds and a nice quiet retreat in the woods. Excellent directions were provided for some of the less well known local spots like Clifton Beach. What an exciting trek! We also enjoyed lunch at the local 12 Apostles Inn in Princetown. Situated on the Great Ocean Road.